Here is a chapter by chapter description of the 2nd edition Advanced Fighting Fantasy (AFF) rulebook. The new rules have taken AFF forward in leaps and bounds. The main benefit that the book has bought is having a new hero creation system which adds more variety and balance than the old, random version. It also creates heroes with lower scores than before, allowing them plenty of time for advancement. The rules allow the heroes more chances to make decisions in combat, allowing them to do something other than try to hit an opponent. It also has a wide selection of spells and a larger number of magical items and treasure for the heroes to use. The return mass battle rules and the battle tactics skill. Yet more descriptions of magic items from the main series solo books. 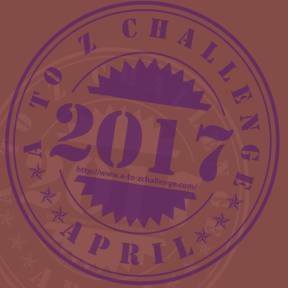 This contains an introductory dungeon crawl which readers of Fighting Fantasy - The Introductory Role Playing Game will recognise. This chapter provides starting characters and descriptions of their skills and spells so that a group of players and a director can start with a minimum of fuss. 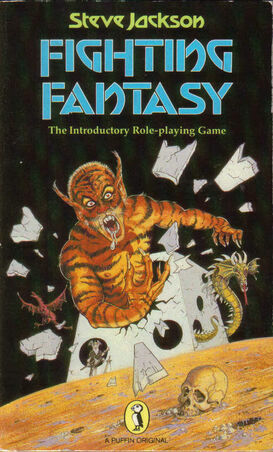 For someone who has read Fighting Fantasy - the introductory role playing game, I enjoyed the nostalgia of some of the encounters such as the dwarf eating house. The new version of Advanced Fighting Fantasy still uses skill stamina and luck scores. Characters can also have a magic score. Instead of finding these scores randomly, they are determined with a points system. A starting hero's skill can be between 4 and 7 depending on how many points they spend. Every character could have a maximum starting skill of 7 if they wish. Right then, that's Advanced Fighting Fantasy completely sorted. See you next week. Seriously though, having a difference in skill between 7 and 12 and having this score determined randomly created a huge imbalance in the game. I found it a testament to Graham's savviness with the system that all of his non-magic using heroes started with a maximum starting skill of 7 (magic using heroes have to invest most of their points into the magic skill, but that is worth it as they get plenty of spells and powers as mentioned below). He knows what makes Fighting Fantasy tick. This chapter also includes a list and description of the skills that are available to heroes. Every race gets some skills to start off with. For example elves get 1 point in minor magic and forest lore. The chapter gives you the starting skills for humans, elves and dwarves. However, the book also gives you information on how to create heroes of different races. There are fewer skills than the original AFF but that is a good thing. The original AFF had skills that were very narrow such as battle combat, siege combat and heavy armoured combat (not very useful considering that they did not tell us the benefits of heavy armour). It also had skills which provided too many benefits in combat such as dodge and strength. All of the skills in the new AFF are useful and more versatile. Weapon skills allow the heroes to use groups of weapons rather than one weapon. Dodge and strength provide benefits but not broken combat benefits. Heroes also now have talents and there is a nice list of talents that heroes can have in order to make their lives a lot easier. Some talents work in conjuction with certain skills and some work on their own. The strongarm talent allows you to increase damage in combat. The swashbuckler talent works with the dodge skill to work as 'armour'. The natural mage talent means that wizards and sorcerers do not need to make rolls on simple spells. The new character creation method provides a lot more opportunities for variety, balance and advancement and is a massive improvement on the old random generation system. This chapter covers the situations that players may come across on their adventures. Most of it is based on the old AFF system but it also contains new bits such as poisons, diseases and when players can use their magic attribute instead of skill. This chapter also covers experience which is nothing like the old AFF system. It is much more versatile (heroes get about 50xp per adventure rather than 1-3 which allows more room for minor differences) and can be used to increase more stats. Every stat except luck can be increased with experience. Combat is the same as the old Fighting Fantasy system but with some welcome add ons. Different armour is given damage reduction values. Armour can't be worn by just anyone. Your skill + armour skill needs to be equal or greater than the armour's value or you get penalised. Also, wizards pay more for spells if they cast them in armour. Critical hits are no longer as deadly as before - they now inflict double damage + 1 skill point of damage. Fumbles are now much more interesting and the hero has to roll two dice to see what happens from a selection of disasters. This chapter also covers the use of the heal skill. A welcome addition to the new AFF is some combat options. Fighting Fantasy is sorely lacking in these. Most combats involve just a comparison of attack strengths which means that players with lower skills than their opponents have a hard struggle. However, rules for surprise, defensive fighting, feinting and other options are covered here which will help heroes in combat. Magic is now categorised as four types - wizard, priest, sorcerer, minor. Heroes can only have one type from wizard, sorcerer and priest magic. Wizard spells are now powered by magic points rather than stamina. The wizard spell list is similar to the magic list from the old AFF books except certain spells are noticeable by their absence such as any spell that restores skill, stamina or luck (now that was a bit broken - having a spell that restores stamina in a list of spells powered by stamina). However, there are still plenty of great spells to choose from. Sorcerer spells use the magic system from the Sorcery! series. This does include a spell that restores stamina but it only improves the effectiveness of a medicinal potion and does not work on the caster. The super broken minor spell Hold it! has been removed. Some other modifications have been made which makes more minor spells useful. Priest spells are completely different from wizard spells. Rather than just having a smaller spell list and restrictions on what they can and cannot do, priests get powers which they can use once or twice a day. These powers cover things that no wizard or sorcery spell can do, such as restore stamina, talk to the gods, give bonuses to luck rolls and protect heroes. They also enjoy a boost to social status and a special power depending on the god they worship. Graham has done a good job in making the magic system more balanced and removing the broken spells and combos with the old system. 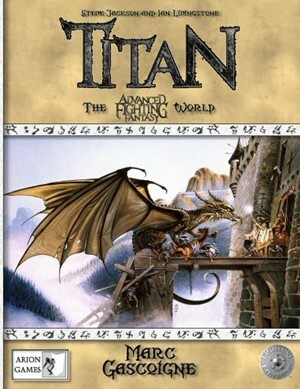 This gives a very short history and geography of the world of Titan. There is nothing new here. Most of this is in the book, Titan. Chapter 7 - Director's Guidelines. This is another very short chapter on how to run an adventure. This is pretty basic stuff along with guidelines on how many magic items a hero should have. Chapter 8 - Monsters and enemies. Since the license that Arion Games holds means that they can only reprint Out of the Pit, not modify it, Graham has included a list of weapons, armour, damage modifiers and special attacks that monsters from Out of the Pit have. This is a useful addition in turning Out of the Pit monsters into AFF monsters. The chapter also provides guidelines on creating challenging yet beatable opponents and NPC villains along with an example non monster enemy. This gives a list of hooks for the heroes as well as a very quick and simple way to make a dungeon - just roll dice onto a piece of paper, join them up with lines and then you have your rooms and corridors. The chapter gives a list of possible antagonists and sub quests that the heroes could take part in as well as another dungeon for heroes to play. The treasure section has been expanded. Heroes can now obtain scrolls as well as plenty of other magical items, many, such as the pocket myriad, blue candle and ivory skull necklace, will be familiar to readers of solo books. It is also much harder to obtain random magical items which unbalance the game. Most items that the heroes will carry will be one use items, which is good. You don't want every other orc carrying a magic sword. Finally, we have some suggested changes to the rules, such as random hero creation (don't worry, it is still likely that you will get a high skill with these rules), creating new races for heroes to play, allowing the heroes to have another talent to start with, allowing the heroes to get two magic specialisations or allowing heroes to become archmages amongst many other things. When it comes to a quick simple and balanced system, the new Advanced Fighting Fantasy book is for you. You have everything you need to start a simple adventure. There is also the potential for much much more and I hope to see more products soon. 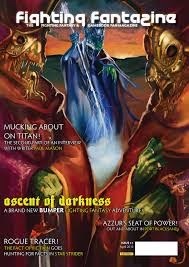 If you want to discuss the new Advanced Fighting Fantasy rules, there us a section in the Arion Games Forum, here.